The church: St Mary's, Castleton, Staten Island, New York, USA. 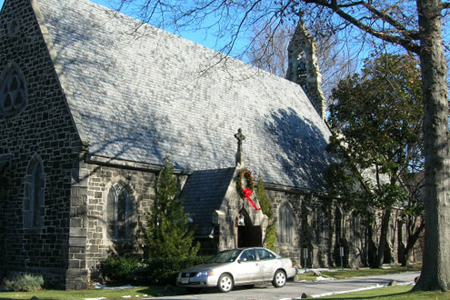 Denomination: The Episcopal Church, Diocese of New York. The building: The original building of 1848 was a frame Gothic chapel; the present stone church was completed and consecrated in 1853. Stone walls also frame the interior; the church is beautifully maintained inside and out. The ceiling is an open timber one, with a series of pointed arches and exposed beams and rafters. 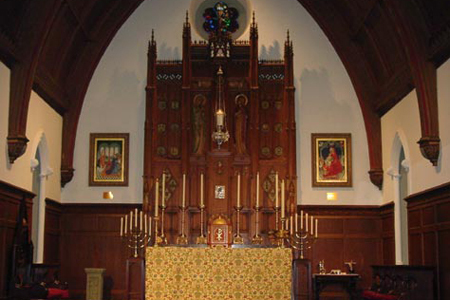 The lovely stained glass windows and the two icons on either side of the altar can be seen in the photo gallery on St Mary's website. The site also describes other building features such as the chapel, choir room, rectory and cloister. The church: It seems to be a very quiet, traditional church. Sunday holy eucharist is at 8.00 and 10.00am; eucharist and Bible study Wednesdays 9.30am; morning prayer Fridays 9.30am. A prayer group meets every third Wednesday. It was hard to tell what the congregation is like with such a small number attending. They seemed to be mainly older adults and dressed both formally and casually. Everyone was friendly. The neighborhood: Castleton is located in the northeastern part of Staten Island and was an independent town prior to the incorporation of Staten Island into New York City in 1898. The town dates from the late 17th century as one of the four original divisions of Richmond County. It was originally set aside as the manor of the governor of the province of New York. Castleton Avenue has many shops and services; an Italian gourmet shop is across the street from the church. The Staten Island Zoo is nearby, as is Forest Avenue with many more stores and restaurants of all kinds (but also much more traffic). The cast: The Revd Richard Markham, Sunday assistant, was the celebrant. The Revd Canon Dr John Derek Stubbs, interim rector, preached. Daniel Fannon conducted the St Mary's choir and presided at the organ. The date & time: Christmas Day, December 25, 2008, 9.30am. The Holy Eucharist, Rite One. Sadly it was almost empty. I counted 15 people. Yes, I was welcomed and given a service leaflet. Yes, comfortable wooden pew, but there wasn't much sitting. Most of the service was kneeling. Of course no one is forced to kneel, but I always complain that there isn't enough kneeling in most churches. Be careful what you wish for! A little talking, but mainly quiet – not that many people were there to talk. "Unto us a child is born; unto us a son is given." The Book of Common Prayer 1979; The Hymnal 1940. A baby cried a few times but the mother was good at hushing so must have been experienced. The organ, which on the whole was very good, at times was too loud and drowned out the singing. I was also distracted by wondering where all the people were and what the service must have been like the night before. Very traditional. No incense and not many bells, but the liturgy was the oldest liturgy that I can remember hearing in recent years. I loved using the 1940 hymnal. There was no exchange of peace, which is always fine with me, but also quite unusual. Rite One in the Book of Common Prayer was followed meticulously. Not many frills, but the small choir sounded lovely when they sang. The offertory anthem was "Nativity Carol" by John Rutter. I noticed that two of the ladies in the choir had little black velvet hats (or sort of a cross between a hat and a ribbon) pinned to their heads. This also seemed very traditional. 5  The Revd Dr Stubbs has a very nice combination South African/British accent. I wasn't sure so I asked, and he said he was from Johannesburg but his parents were English. His style seemed a little too intellectual for me, but I found another of his sermons on the web which was much more down to earth, so I guess it varies. It was a short meditation on the nature of love – rather cerebral and abstract. At the end, we were asked to open the hymnal and look at "Love divine, all loves excelling" – which added two minutes to the five. It was a lovely building to be in; when the choir sang and the organist didn't get carried away, it was very peaceful. I was having a little trouble juggling the lookups in the Prayer Book since I have been spoiled by tome-like service leaflets in other churches which include everything. Also, I am not used to kneeling through an entire liturgy, so I felt a little sore. It wasn't really possible, because everyone was leaving. After shaking the priests' hands and talking to them for a minute, there was nothing to do but leave. There was no coffee, and I think this was a planned short service. 5  I would like to visit again, but if I attended regularly, I would probably need knee replacements. The little black ribbon/hats on the choir ladies.